I was invited to the Moonlight Cake House outlet in Taman Pelangi in Johor Bahru which just reopened after major rebuilding lasting 2 years. 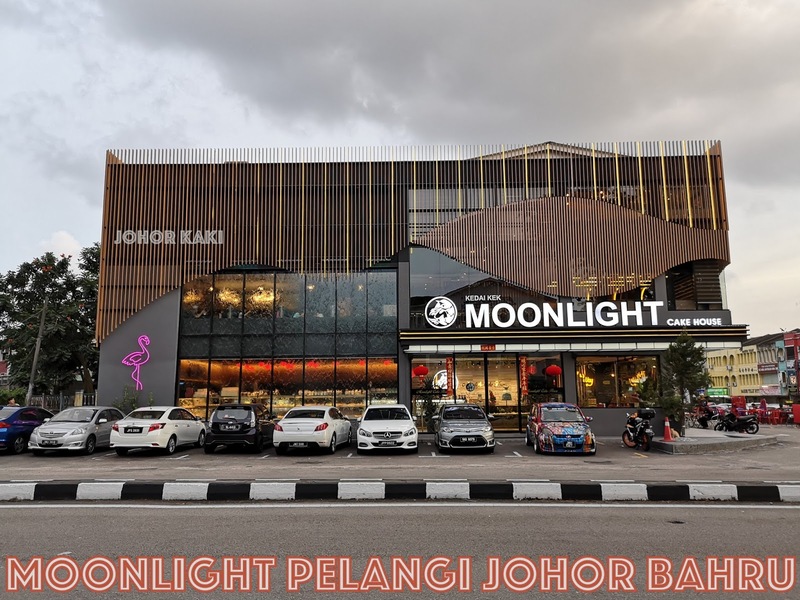 The Moonlight Pelangi outlet has three levels - the cake and pastry shop is at the ground level. The restaurant / cafe is at level one and the top level is for private events (with catering services). 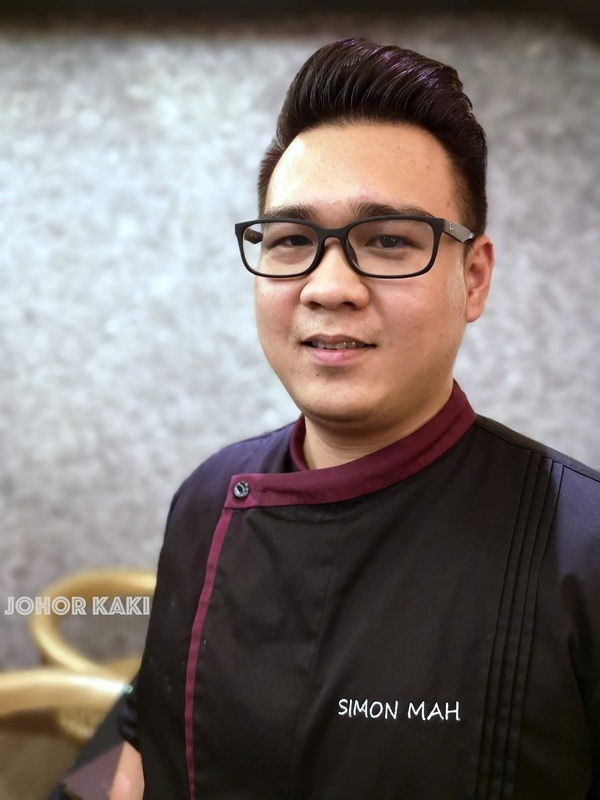 Simon is the Executive Sous Chef of Moonlight in charge of the group's restaurants in Johor Bahru. 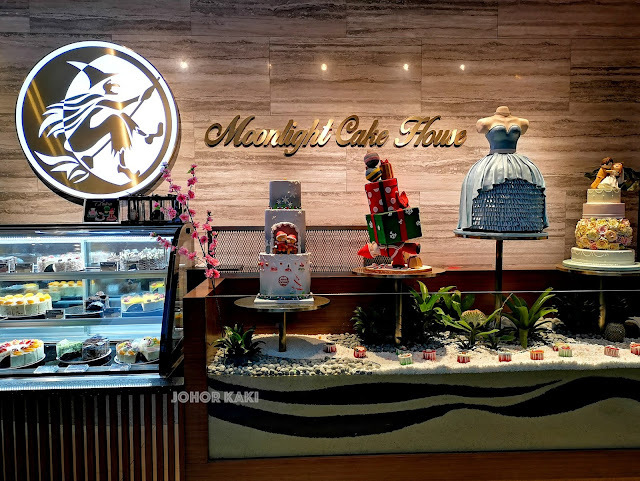 We were at a blogger party hosted by Moonlight Cake House. 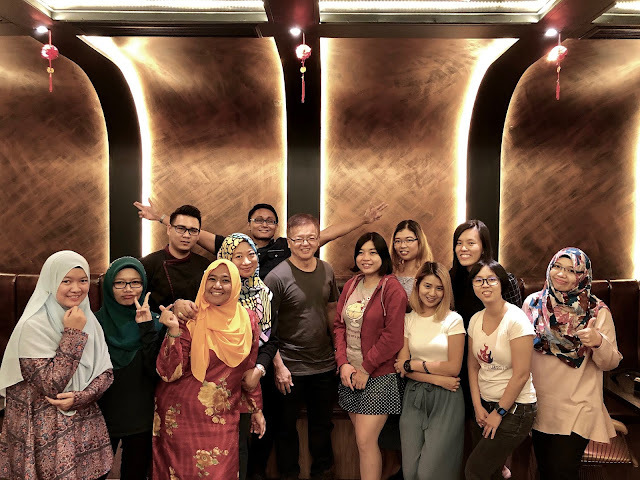 I enjoy meeting friends who share a common passion. 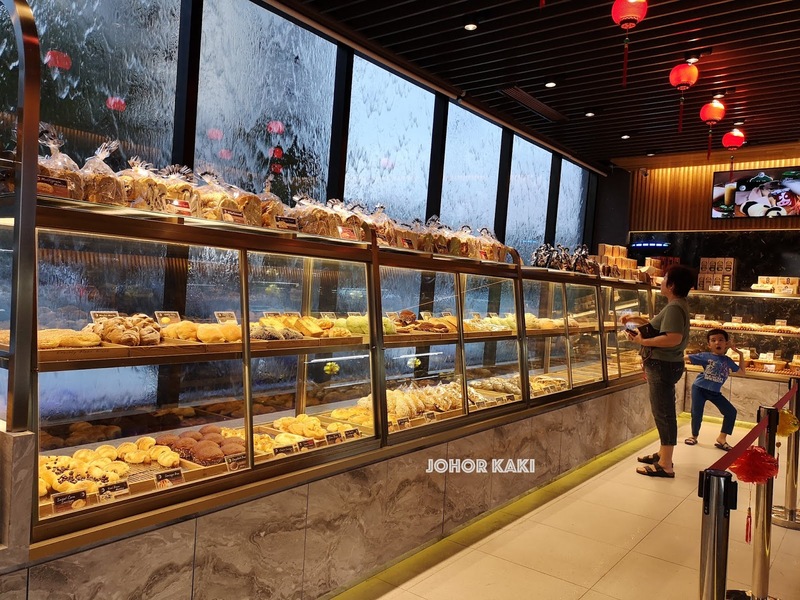 Simon started us off with Mushroom Soup in French Puff (price RM11.80++). 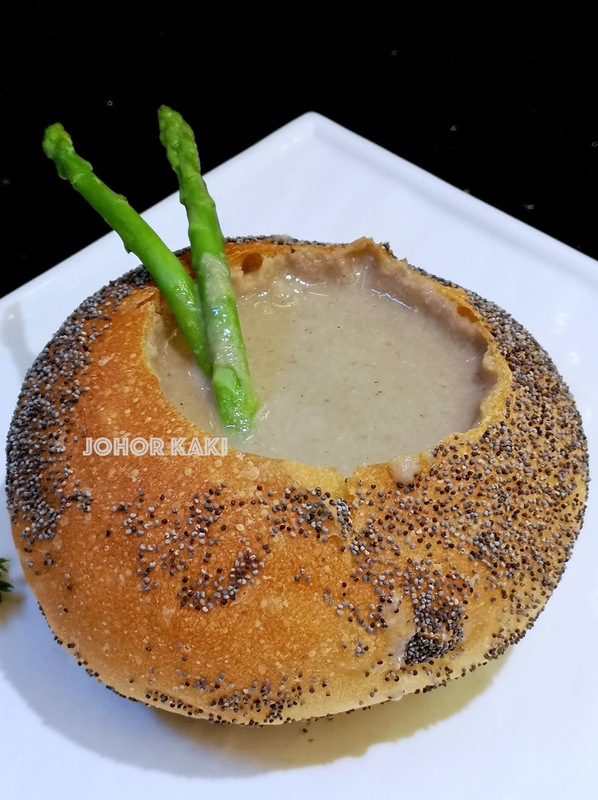 The thick creamy soup made with shiitake mushroom, shimeji mushroom and garlic is served in a house made French puff bowl. I like the savoury sweet flavours and the soft spongy chewy crisp French puff. 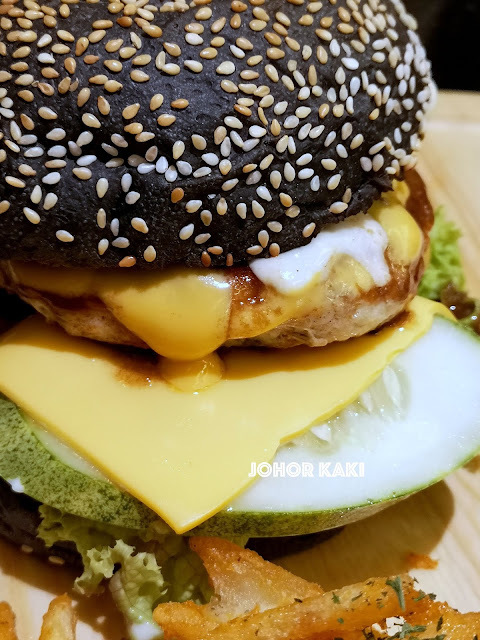 Bamboo Charcoal Homemade Chicken Burger (price RM17.85++). House made minced chicken patty with tomato, lettuce, caramelised onion, gherkin (pickled cucumber), house made sauces and cheddar cheese between house made puffy soft bamboo charcoal buns. Served with crisscross potato chips. 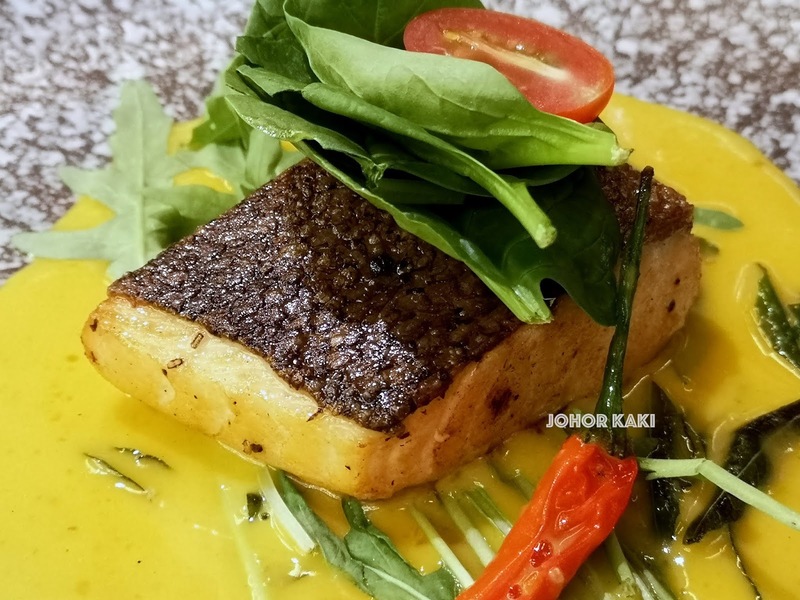 Grilled Norwegian Salmon & Salted Egg Rocket (price RM20.75++). 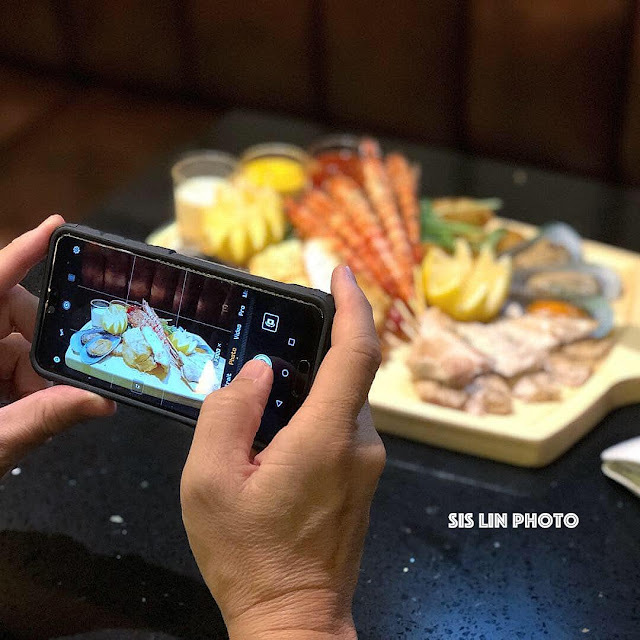 Thick slab of grilled salmon with cherry tomatoes and rocket greens on salted egg sauce. I am not a fan of grilled salmon as I don't really like its "salmon" taste. 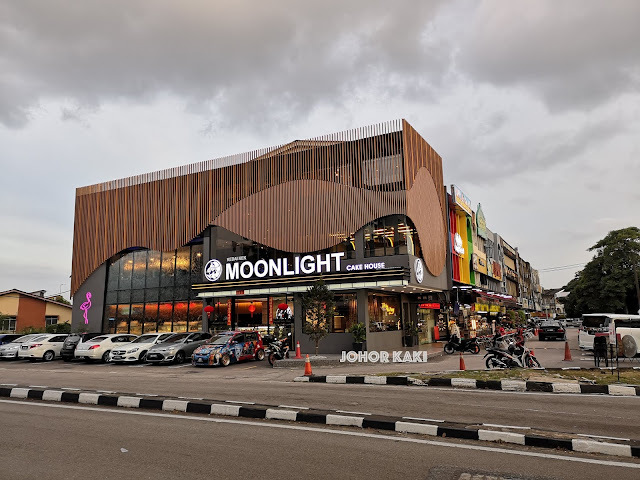 But, this at Moonlight didn't have that taste and I quite enjoyed it. Salted Egg with Chicken and Floss Fried Rice (RM15++). 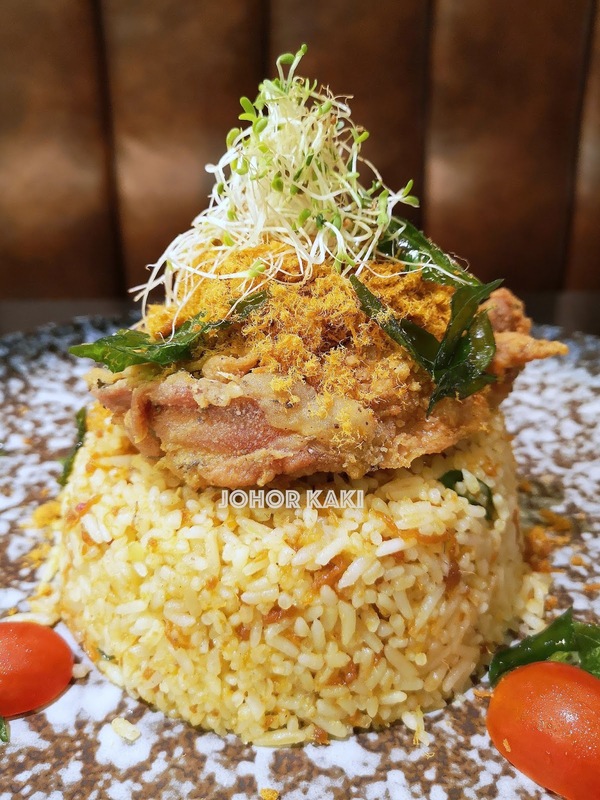 Springy soft-crunchy savoury fried rice topped with crispy fried chicken chop and chicken floss. I like the rice fried with salted egg yolk a lot and would come back for it. 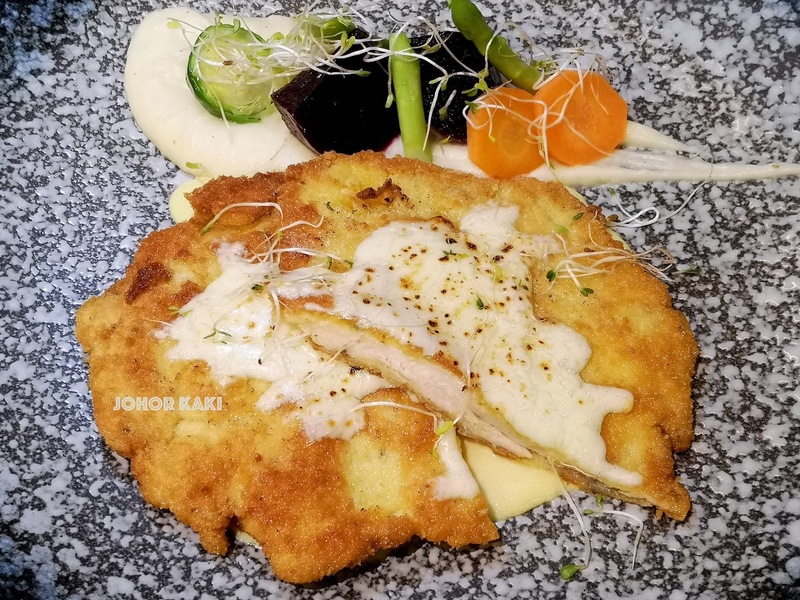 Piccata Chicken Breast with Mozzarella Cheese and Cream Yellow Mustard (price RM21.30++). Pan fried Parmesan flavoured chicken breast served shimeji mushroom, asparagus and mashed potato. 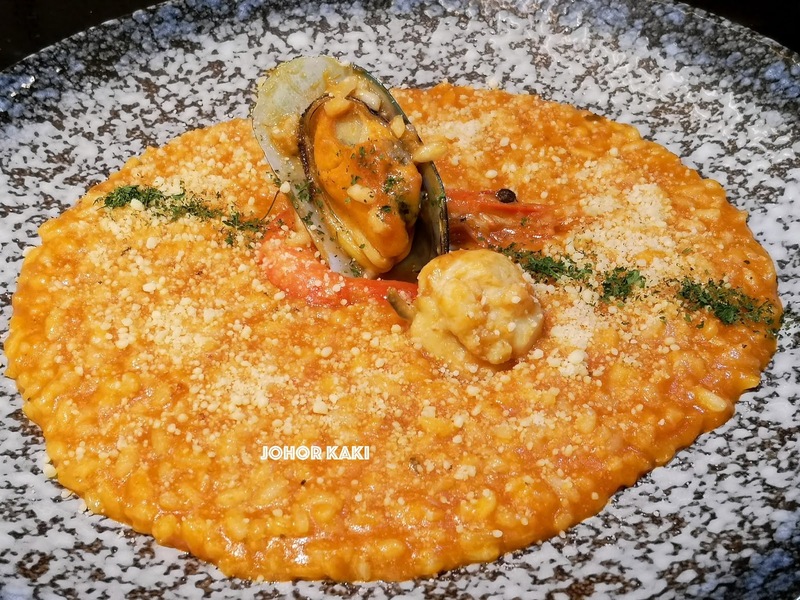 Risotto with mussel and tiger prawn baked in tomato sauce. 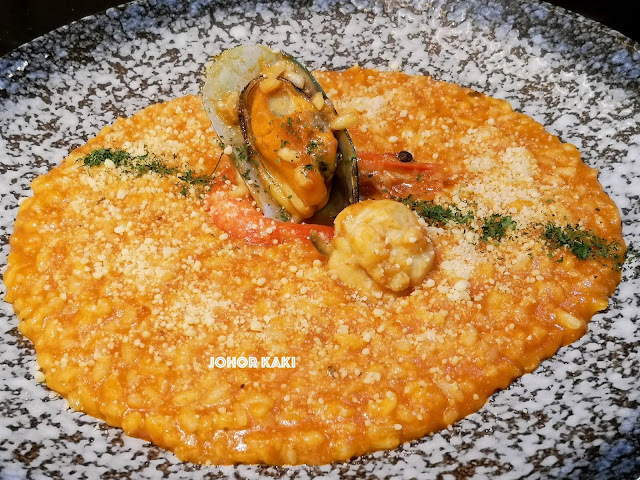 Served with topping of shaved Parmesan cheese. I like the mouthfeel of the soft-crunchy risotto rice. Australian Lamb Shank (price RM49++). 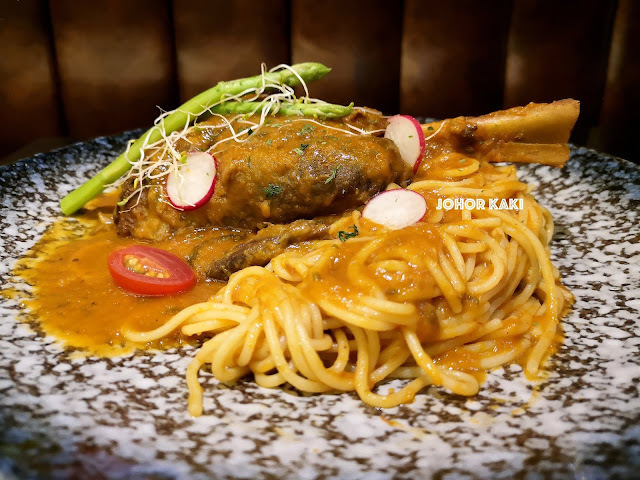 28 hour sous vide lamb shank served with spaghetti sautéed with tomato sauce and olive oil. I like the very tender and juicy sous vide lamb shank. There was a bit of gamey taste (which I enjoyed) underlying the savoury tangy tomato sauce. The spaghetti was done soft (one notch below al dente). 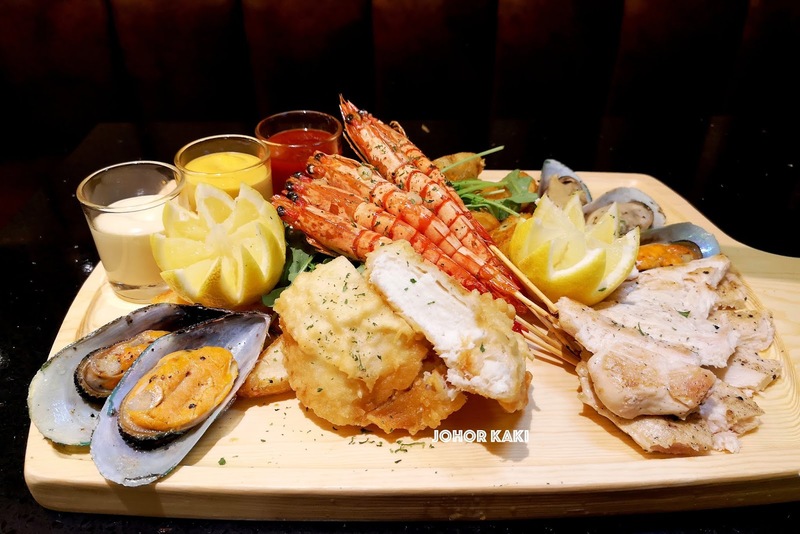 Moonlight Sharing Platter (price RM43.30++). Garlic butter grilled butter prawns, mussels, sous vide chicken breast, sausage, crispy fish, corn on cob and potatoes. 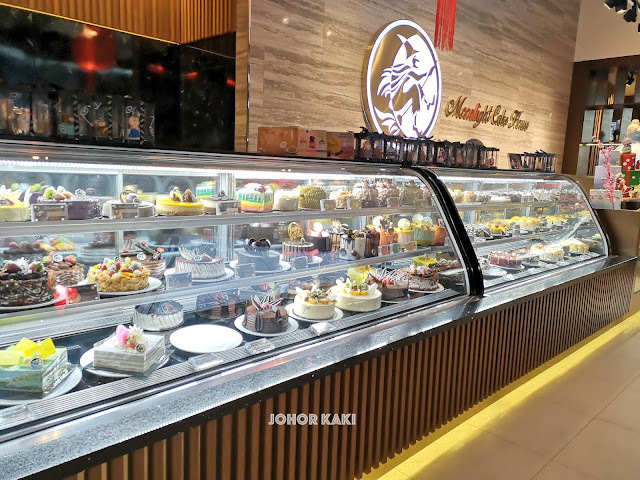 Information for you 👉 Fans of Moonlight Cake House @ Taman Pelangi, your favourite cake shop and cafe is now opened with an all new look and menu. Come and check it out. Disclosure: This was an invited tasting.